A variety of the mineral beryl (Be3Al2(SiO3)6) colored green by trace amounts of chromium and sometimes vanadium. 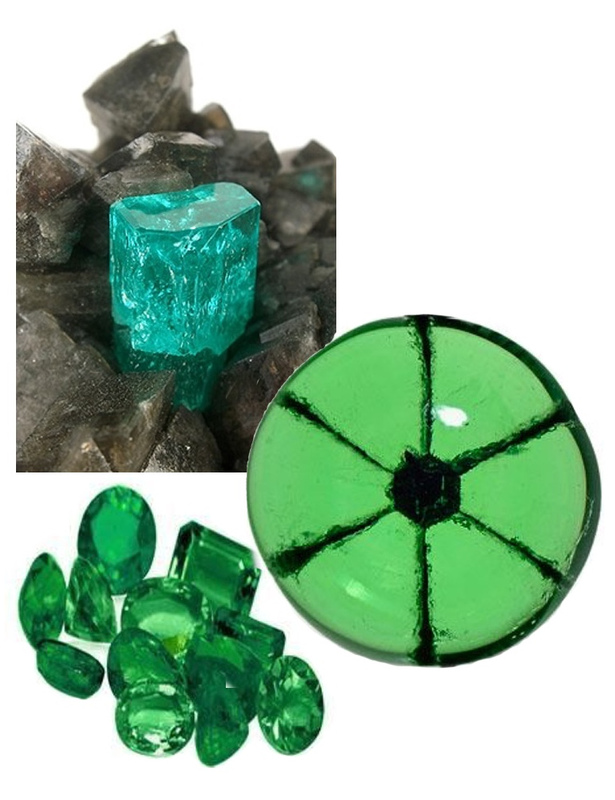 Beryl has a hardness of 7.5–8 on the 10-point Mohs scale of mineral hardness. The name comes from the old French “esmeralde”, that was derived from the Greek word “smaragdos” meaning “green stone”. Innumerable fantastic stories have grown up around this magnificent gem. The Incas and Aztecs of South America, where the best emeralds are still found today, regarded the emerald as a holy gemstone. However, probably the oldest known finds were made near the Red Sea in Egypt. These gemstone mines, exploited by Egyptian pharaohs between 3000 and 1500 B.C. and later referred to as “Cleopatra’s Mines”, had already been exhausted by the time they were rediscovered in the early 19th century. Written many centuries ago, the Vedas, the holy scriptures of the Hindus, say the following of the precious green gems and their healing properties: ‘Emeralds promise good luck’ and ‘the emerald enhances the well-being’. No wonder the treasure chests of Indian maharajas and maharanis contained wonderful emeralds. Emerald is the official birthstone for May and the official anniversary gemstone for commemorating the 20th and 35th year of marriage.